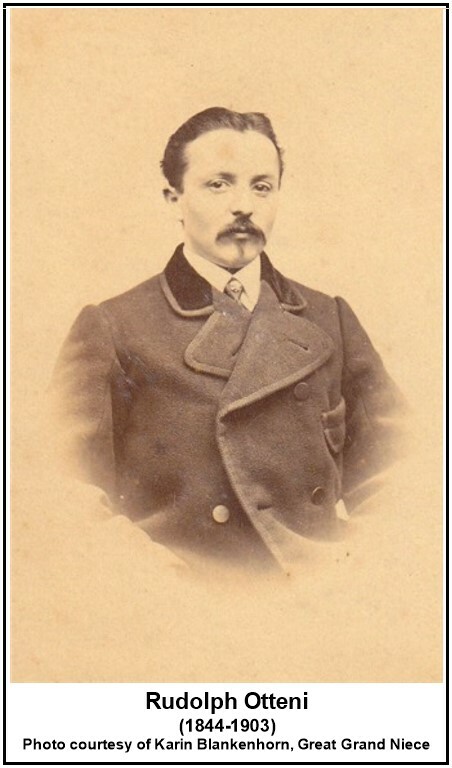 Rudolph Otteni is the son of Franz Josef "Joseph" Otteni and Maria Eva Weber. He was born in Germany in Mar 1844. Rudolph's mother died when he was 12 years old. Rudolph's ancestors on his Otteni side can be traced back to his Great Great Great Grandfather, Hans Georg Otteni, who was born in 1655. The name, Rudolp Ottin, appears in the "Passenger and Immigration Lists: Germans to America 1850-1874 Archive". The 1900 U.S. Federal Census lists his immigration date at 1861. Per the Naturalization Records of Philadelphia, Pennsylvania, Rudolf became a natuarlized U.S. citizen on 13 Sep 1880. The name of Emma Otteni, widow of Rudolph Otteni, late of Company L, Third Regiment New Jersey Volunteer Cavalry, and pay her a pension at the rate of twelve dollars per month and two dollars per month additional on account of a minor child of said soldier until such child shall arrive at the age of sixteen years. Per the 1890 Veterans Schedules, Rudolph enlisted in the Union Army on 19 Oct 1864 and discharged on 28 Aug 1865 as a Private in the New Jersey Calvary Company H.
Rudolph's father, Joseph, died in 1866. Joseph's widow (2nd wife not Rudolph's mother) planned to continue running the family printing business. But Joseph's heirs did not accept this. After long negotiations, during which Rudolph came back to Germany from America, the heirs finally bought the business and started "A. Reiff & Cie." in 1867. The owners were Alexander Reiff (husband of Rudoph's sister Luise Otteni), Leopold Stefan (husband of Rudolph's sister Emma Otteni) and Rudolph Otteni. After a year and a half, Rudolph left the business and started his own newspaper and printing business on January 1, 1869. The name of the newspaper was "Kinzigbote". After running it for some time, Rudolph returned to America in 1880. The Philadelphia City Directory of 1890 lists Rudolph Otteni as running a printing business at 4500 Brown, Philadelphia, PA and Emma Otteni, his wife, was running a dry goods business at the same address. According to the 1900 U.S. Federal Census, Rudolph and family resided in Wilmington Hundred, New Castle County, Delaware. His occupation is listed as a printer. 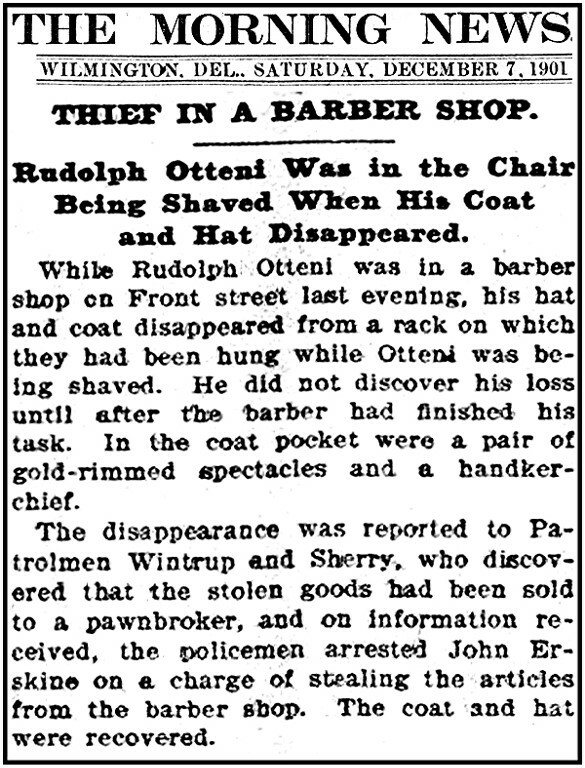 In 1901, Rudolph had his coat and hat stolen while getting a shave in a local barber shop. Rudolph died in 1903. He is buried at Cathedral Cemetery, 2400 Lancaster Avenue Wilmington, New Castle County, Delaware. Emma Otteni died 21 Jul 1914. She is buried at Cathedral Cemetery, 2400 Lancaster Avenue Wilmington, New Castle County, Delaware. 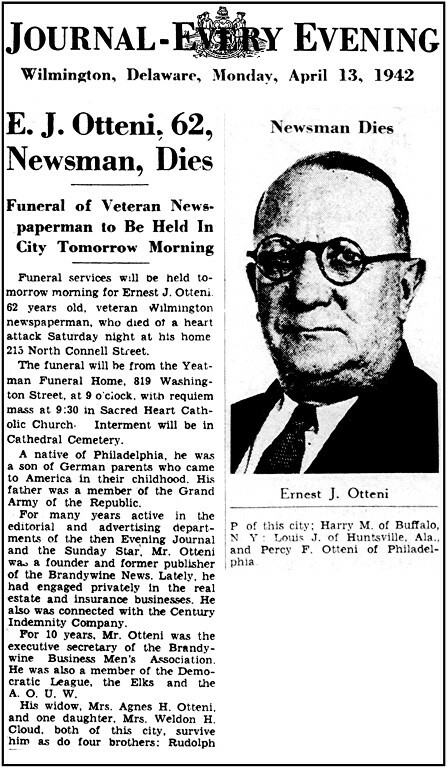 Rudolph's son, Ernest Otteni, was also in the newspaper business. His obituary appeared in the Journal-Every Evening, 13 Apr 1942, Wilmington, DE. Another son, Louis Otteni, served in World War I. According to a newspaper article in the Delmarvia Star, Wilmington, DE, Sunday, 30 Jul 1919, he was cited for his actions during the war. In an interesting history of the 1st United States Engineers 1st United States Division, printed at Coblenz Germany, April 15, 1919, appears in the regimental roster, officers and men serving between October 16, 1917 and November 11, 1918, the names of six Wilmingtonians who served in the famous regiment. Of the six men, one died of wounds received in action, one gassed in action, and one cited for distinguished conduct. Sergeant Otteni on a recent visit for a month at the home of his brother, Ernest J. Otteni, having languishing in a hospital in France for two months, suffered with nervous breakdown, spoke very little about the exploits of the First Engineers. He recoiled from any discussion on the subject. The first intimation that he had been cited became known here yesterday. Sergeant Otteni is now in charge of the Army recruiting Station at Worcester, Mass. He does not know of this publication. The Division Commander cites the following officers, nurses and men for distinguished conduct in the operations between the Argonine and Meuse (ten were cited). "Sergeant 1cl Louis J. Otteni, Co. A, 1st Engineers 'displayed .... and distinguished bravery in securing information confirming the location of the enemy machine gun nests, and by tactfully leading his platoon caused the destruction of enemy strong points and established the advanced outposts." The descendants of Rudolph Otteni spell their name OTTENI. 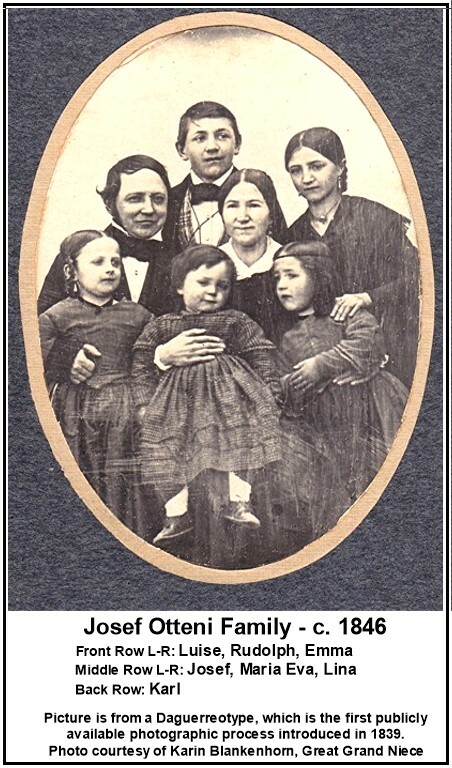 Descendants of Rudolph Otteni (1844-1903) - a privatized (dates & places of living people omitted) 5 Generation Descendant Book (PDF), starting with Rudolph Otteni - 5 pages plus index.